Looks good, seems to be built well and reliable Buttons aren't very well labelled - may be unsuitable for the elderly. 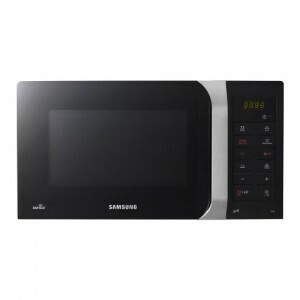 The GS89F1S is a smart looking black and silver microwave manufactured by Samsung. As you'd expect from Samsung, the appliance both looks good and performs well - it is a touch more expensive than some equivalent models from rival manufacturers - however you do get a little more peace of mind with Samsung, with their renowned reliability. Overall capacity is just over average at 23 litres, and power is 800w - making this ideal for regular use in small to medium sized households. The inbuilt grill offers 1100w of power, and the digital display is clear and easy to read. One small criticism is the fact that their aren't many labels on the controls - meaning that initially you may find yourself checking the manual to see which button operates which mode. In the long term you'll no doubt be able to remember, but initially this can be a bit of a pain. 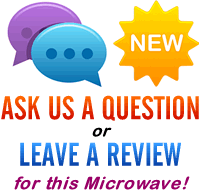 The build quality is very good, and it cooked well - we did not experience any issues with the performance of this microwave. The black and silver colour scheme should suit most modern kitchens - our testers were complimentary about the design - it looks smart yet subtle. A decent 23 litre capacity microwave - cooks well. If your eyesight isn't great, then you may wish to look elsewhere - for everyone else, this GS89F1S microwave will offer reliable service and is pretty good value.